$99.95 by a phony music publisher. �Gonna Buy Me A Dog� Written & Produced by Tommy Boyce & Bobby Hart. At The Monkees� pad, Michael receives mail from the postman: one a sub-booklet for Peter about a body building school, another is a letter for Michael from The High Class Music Publishing Company whom offer him a chance to write a song and get rich and he decides to show them a song he�s written: �Gonna Buy Me A Dog� (actually a Boyce-Hart tune!) Mockingly, Micky and Davy do a fantasy sequence as vaudevillians with David on piano and Micky naming their latest songs. However, Michael is convinced songwriting is a business worth millions; as he answers the door again, the postman returns to inform Michael there�s $.06 due on his letter. Later that day, Michael arrives at The High Class Music Publishing Co. (which also does Greeting Cards, Storm Windows, Reconditioned Vacuum Cleaners, Magazine Subscriptions, and Door Lettering!). Once there, he greets another aspiring songwriter: a little old man who wrote �My Funny Valentine� (never mind there�s a song has already been written with that title!). Then Michael goes in the office of Bernie's Class and submits the lyrics of his song. Bernie, who is terribly unable to pronounce Michael's last name, praises it and tells him of his plans to sell the song to Joanie Janz, the hottest singer in show business, who�ll use the song in her latest movie in exchange for $100 for legal fees and incidentals. Michael is so excited about this that he uses the telephone booth to call up Micky, his mother, and Mr. (Tim?) Conway, whom he met on a bus five years ago. Back at home, The Monkees, excited about Michael�s impending success, imagine a sequence set to �Gonna Buy Me A Dog� featuring them traipsing all over a park with (what else?) a pack of dogs. Having pawned his guitar for only $99.95, Michael pays the amount to Bernie and questions him again about his plans regarding his song. To prove it, Bernie personally phones Janz, but only pretends to do so in order to dupe Michael, and instead inadvertently calls a policeman Harry (whose wife Hilda is cheating on him!). Sure he's on his way to fame and fortune, Michael then tells the guys of his big break on the phone but Micky tells David and Peter that he may be the victim of a con man. Not knowing what else to do they decide that this is a job for Monkeemen and change into superheroes. All but Peter fly away; leaving him to walk instead. While disguising themselves as piano tuners, the guys go into Bernie�s office to spy on him. They spy on Bernie speaking into a dictophone telling to put a letter he wrote to Michael �praising� his song into mimeo and have 500 copies printed. This convinces them well beyond a doubt�s shadow that he is a swindler, and they attempt to warn him. Meanwhile, Michael takes his song to the soundstage where Joanie Janz is making The Wolf Girl Meets The Vampire In The Old West, but becomes dejected when Joanie tells him she never heard of him or his song! Back at the pad, a depressed Michael, oblivious to such a rejection but refusing to believe he was conned, sadly hides in his room on his bed, resisting every attempt his mates make to cheer him up. Then the others come up with an idea to help Michael so Micky calls up Bernie claiming to be a big shot movie mogul M.D. asking to meet him at the studio. At the studio, there, Micky, David and Peter � as M.D. and his yes men, respectively -- park The Monkeemobile in Dean Martin's spot and brashly proceed to take things over, convincing everyone including the director and producer that Micky�s a big shot. When Bernie arrives, he finds the producer and his camera personnel fawning over �M.D.� and his pals. �M.D.� tells him about his new movie starring Joanie Janz, Gregory Peck, Elizabeth Taylor, Doris Day and Sonny Tufts (his first low-budget picture! ), and that he wants a song whose title must include a dog, because Joanie will be portraying the part of an animal lover. The sham has Bernie fooled as he suggests Michael's tune, �Gonna Buy Me A Dog,,� and, within 8 minutes, he gets him over to the studio, but Michael asks for $200 in order to place the song under exclusive contract. Bernie only produces $199, but Michael takes it anyway, and the four Monkees laugh at having turned the tables on the swindler. A song sequence set to �Mary, Mary� ensues, with the boys gallivanting around a soundstage as they chase Peter about. Later, Michael shares his money with his fellow victim, the old man, since they�ve both been swindled and the old man tells Michael about his new song he plans on writing called �I Want To Buy Me A Dog�. As Michael, Micky and David prepares to leave, they find Peter missing; they look up in the sky and discover Peter, garbed in super heroic Monkeeman gear, now finally able to fly through the air. Screen Gems' original synopsis for �I've Got A Little Song Here� features a rejected story idea in which Michael, in Bernie's office, meets Ceil, Bernie's secretary, and two other aspiring songwriters: a little old lady and a truckdriver. The synopsis also reveal the original name of the studio: Magnum Studios. Watch out for cameoes by David Price, Richard Klein, Valerie Kairys and David Pearl as Mammoth Studio crew personnel. Though Tommy Boyce and Bobby Hart composed �Gonna Buy Me A Dog� and not Michael Nesmith (as �I've Got A Little Song Here�'s premise implies), Papa Nes did produce 10 takes of a bluesy instrumental backing track to the tune during a Thursday, July 7, 1966 session at Western Recorders Studio 2 in Hollywood. After 40 years in the vaults, Rhino saw fit to include Take 1 of this session as a Bonus Selection on Disc 1 of the August 15, 2006 2-CD Deluxe Edition reissue of The Monkees' first album (R2 77678). The portion of Boyce and Hart's �Gonna Buy Me A Dog� which featured Micky and David spouting jokes was deleted to fit within the time frame of this episode's musical sequence, which wasn't long enough to accomodate the entire song. Appearing for the first time in the soundtrack of The Monkees is a musical cue composed by Stu Phillips based on the song "Hooray For Hollywood," a tune composed by Richard A. Whiting and Johnny Mercer and sung by Johnny Davis and Frances Langford and performed by Benny Goodman and his Orchestra in the 1938 Warner Bros. musical romance Hollywood Hotel. Other Monkees segments to use the "Hooray For Hollywood"-inspired piece were Episode No. 30, �The Monkees In Manhattan� (a.k.a �The Monkees Manhattan Style�), No. 31, �The Monkees At The Movies�, and No. 34, "The Picture Frame" (a.k.a. "The Bank Robbery"). 5 days after NBC's first-run telecast of �I've Got A Little Song Here,� The Monkees preformed 2 practice sets at their first concert at The Honolulu International Center Arena in Honolulu, HA. The overwhelming response eventually led to their first U.S. tour, which kicked off in Denver at the end of the month. The June 26, 1967 repeat of this episode featured the song "For Pete's Sake" (later used as the closing theme to the television show's second season) and CBS and ABC Saturday Afternoon repeats of the segment featured the song "Steam Engine." Rhino has restored the firstrun NBC version for release on home video, while the summer 1967 repeat still airs in syndication. David Jones had previously performed "Gonna Buy Me A Dog" in an episode of The Farmer's Daughter (ABC, 1963-66), "Moe Hill And The Mountains" (1/7/66), which also guest starred Stacey Maxwell (�Monkee See, Monkee Die�). The B&W screen tests of Michael and David seen in the series pilot were filmed on the set of The Farmer's Daughter. The boxing glove next to Michael's bed in The Monkees' downstairs bedroom foreshadows events in Episode No. 20, �The Monkees In The Ring�. If you guessed the threads Micky, Michael and David were wearing at the end of �I've Got A Little Song Here� looked familiar, you guessed correctly! This was the same clothing they wore in Episode No. 7, �The Monkees In A Ghost Town.� (Incidentally, in Act III of �I've Got A Little Song Here� and in the romp for �Mary, Mary�, Peter wears a gold 8-button shirt similar to the one worn by David in �The Monkees In A Ghost Town�.) Another episode, No. 4, �Your Friendly Neighborhood Kidnappers�, finds David, Peter and Michael wearing the same clothes (Micky wears a different shirt) in the scene where they place their hands in cement in fromt of The Chinese Theater. The Mammoth Studio lot resurfaced (abandoned, yet!) in Episode No. 34, "The Picture Frame" where it served as a secret hideout for sleazy con artist J.L. (Cliff Norton) and his toady, Harvey (Jonathan G. Harper). A mention of Mammoth Studios is made in Episode No. 31, �The Monkees At The Movies� (there, Philo [Hamilton Camp]'s report of Mammoth Studios' being "closed for years!" adds pretext as to why it's abandoned in "The Picture Frame"). This is the first appearance of The Monkeemen. Other apperances were in Episode No. 26, �Monkee Chow Mein,� and in the �Sunny Girlfriend� musical sequence of Episode No. 38, �I Was A 99-lb. Weakling.� The footage from this episode of the superhero-garbed David and Micky taking off from their pad (leaving Peter behind) was used in The Monkees second season main title opening. Composer Stu Phillips' Monkeemen fanfare cues were reused in Episode No. 17, �The Case Of The Missing Monkee�, �Monkee Chow Mein�, No. 29, �The Monkees Get Out More Dirt�, No. 50, "The Monstrous Monkee Mash", and No. 58, "Mijacogeo" (a.k.a. "The Frodis Caper"). The late Dean Martin is given reference for the first time on this show in �I've Got A Little Song Here�. Other references are in Episode No. 14, �Dance, Monkee, Dance�, and No. 55, "The Monkees Mind Their Manor". The 1952 20th Century-Fox movie musical With A Song In My Heart starring Susan Hayward and Rory Calhoun is given reference in �I've Got A Little Song Here� by Peter Tork. The title is derived from the song of the same name, which was composed in 1929 by Richard Rodgers (music) and Lorenz Hart (lyrics) and first appeared on Broadway in the musical Spring Is Here. Another Richard Rodgers-Lorenz Hart tune is mentioned in this episode (by Old Man [Owen McGiveny]): "My Funny Valentine." This song appeared in Rodgers-Hart's 1937 Broadway version of Babes In Arms and the 1957 Columbia Pictures version of John O'Hara's play Pal Joey, in which it is sung by Kim Novak, who played Linda English in the film. In this episode, Michael claims he's 21...when, in actuality, at the time of this episode's production, he was 23! The Postman (played by Bobby Johnson) is called Bobby on-screen by Michael Nesmith. In his disguise as "M.D.," Micky is seen wearing a pair of sunglasses...which would reappear in Episode No. 34, "The Picture Frame" (a.k.a. "The Bank Robbery"), No. 35, "Everywhere A Sheik Sheik", and No. 46, "The Monkees On The Wheel". Also, M.D. orders his "yes men," David and Peter, to "take a memo! Going into production for my new film, The First Ten Days Of Pompeii. Have the ads read: 'You've read the book, now see the movie!' Take another memo. Have somebody write a book called The First Ten Days Of Pompeii." This is a satirical nod at The Last Days Of Pompeii, a novel written in 1565 by Edward George Bulwer-Lytton which, at the time of this episode's airing, had had numerous movie versions produced from it. Other Monkee encounters with con artists can be seen in Episode No. 38, �I Was A 99-lb. Weakling,� and No. 57, "The Monkees Blow Their Minds". The first airdate of �I've Got A Little Song Here� on CBS Saturday, March 7, 1970, occurred on the eve of Micky Dolenz's 25th birthday. Its second and last, November 6, 1971, took place a full 3 years after the World Premiere of The Monkees movie HEAD in New York City. When Peter changes out of his Monkeeman costume into his piano tuner disguise, he comes out wearing a pair of thick black-rimmed glasses, similar to those that George Reeves wore as Clark Kent in the TV series The Adventures Of Superman. Here, Bernie Class charges Michael $100 for legal fees and incidentals for his song, yet accepts when he's a nickel short. 35 episodes later, in No 47, "The Monkees Christmas Show", the doctor (Rege Cordic) initially bills The Monkees $20 for Peter's injuries, but charges a nickel less due to the Xmas holiday. After her appearence as Joanie in this episode, Leigh Chapman forsook acting for writing, a vocation she had engaged in before in The Wild Wild West (CBS, 1965�70) and the 1965 United Screen Arts movie A Swingin' Summer. Chapman later helped script screen and teleplays such as the December 3, 1966 Mission: Impossible (CBS, 1966�73) episode "Fakeout" and such movies as Dirty Mary, Crazy Larry (20th Century-Fox, 1974), The Octagon (American Cinema, 1980), and, her most recent writing effort to date, Storm And Sorrow (Hearst Entertainment, 1990), which is based on her book. Irwin Charone (the producer) and Larry Gelman (the director) make other appearances on The Monkees show: Charone as Mayor Motley (who has the same problem pronouncing Michael's surname as did Bernie Class) in Episode No. 36, "Monkee Mayor" and Gelman as the Stage Manager in Episode No. 23, "Captain Crocodile" and the Salesman in Episode No. 47, "The Monkees Christmas Show." Gelman later went on to play Vinnie on The Odd Couple (ABC, 1970-75) and Dr. Tupperman on The Bob Newhart Show (CBS, 1972-78). The late Phil Leeds (Bernie Class) appeared with Monkee guest actor D'Urville Martin (�The Monkees In The Ring�) in the 1968 Paramount horror classic Rosemary's Baby; he has also appeared in small parts in some well known films as The History of the World Part 1 (20th Century-Fox, 1981), Beaches (Buena Vista, 1988), Enemies: A Love Story (20th Century-Fox, 1989, written and directed by Monkees series pilot co-author Paul Mazursky) and Ghost (Paramount, 1990). Leeds wrapped up his career as recurring character Judge Dennis "Happy" Boyle on Ally McBeal (Fox, 1997-2002). Joseph Mell (Harry) portrayed Bill Pence on Gunsmoke (CBS, 1955-75). 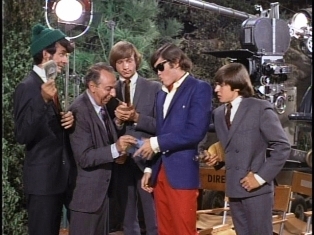 A month after his appearance on The Monkees, Mell turned up in a December 24, 1966 episode of Get Smart (NBC/CBS, 1965-70), "The Whole Tooth And..." with future Monkee guests Robert Strauss (�Alias Micky Dolenz�) and Stuart Nisbet ("The Monkees In Texas"). Several of �I've Got A Little Song Here�'s guest cast members made appearances on Bewitched (ABC, 1964-72) with other Monkee guest alum: Owen McGiveney (Old Man) appeared with Oliver McGowan (�Monkee See, Monkee Die�, �Captain Crocodile�) in the June 2, 1966 episode "The Girl With The Golden Nose" (directed by R. Robert Rosenbaum, assistant director of �The Monkees On Tour�); Irwin Charone (producer), with Vince Howard (�Monkee See, Monkee Die�) in the December 28, 1967 episode "Samantha's da Vinci Dilemma"; and Joseph Mell (Harry), with Dort Clark (�Monkees A La Carte�, "The Picture Frame" [a.k.a. "The Bank Robbery"], "The Monkees On The Wheel") in the January 5, 1967 episode "Sam In The Moon."